of your choosing in my shop. and pick your top three favorite items. comment section of this post. of the three items you have chosen. Do you want more chances to win?? 2. Blog about this Giveaway on your blog. and you will get another chance!! and your chance will keep growing!! things to increase your chances. drawing for each additional action you do. to throw in one of your other choices to sweeten the deal!! Now hurry up and get going!! You've got some window shopping and blogging to do!! My!!! What a busy bee you are!! I am a dedicated follower and after perusing your Etsy store, I am in love with anything with your vintage bee on it..
Ooh Goody, what a lovely giveaway! C. The French Bee Sachet + Garlend Leaf Frame. Now my little French fingers are crossed and I wait with anticipation for 'mon bon chance' to come through. Oh Gail, you really go all out for your first giveaway! You are such a sweetie! Okay, let's see if I got all of this right . . .
1. Of course I'm a follower! Gotta see all your pretties! 2. So hard to choose just 3 things from your etsy! But -- love, love, love the pink vintage french postcard pillow with pink fleur de lis, the keep calm and carry on union jack sachet and the beautiful you are in my heart near and dear necklace. 3. If blogger cooperates, I'm going right now to put your button on my sidebar where all the good giveaways are! 4. And, you'll be added to my blogroll ASAP! I'm just sorry I don't do facebook! I know, I'm the only one in the world who doesn't! Thank you for all of the inspiration I get from your blog! Hope you get oodles of comments but I still want you to pick me! I am loving these items from the shop! I am a follower and I like 1- The near and dear heart and wings t shirt. 2- You are in my heart near and dear necklace. 3- Pink Vintage French Postcard pillow with bee. 3:cotton waffle kitchen towel with vintage french label..
1.2 sided pink vintage Postcard Sachet. 2.Near & Dear Heart T-Shirt. Wow, what a fabulous giveaway! You know I'm a follower, and a FB friend. 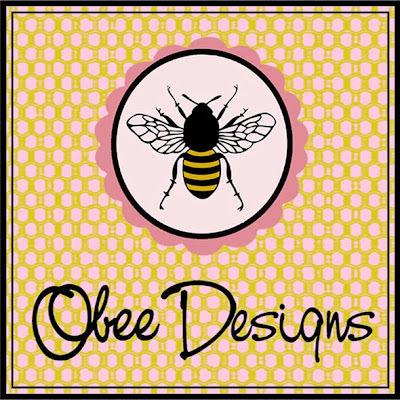 So many beautiful new additions to Obee Design. 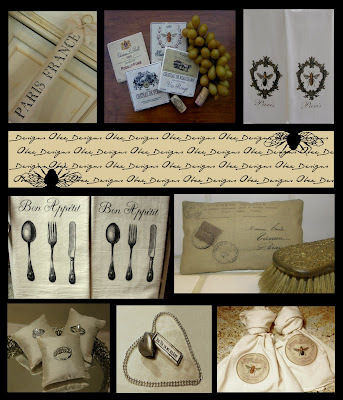 I love the Near & Dear necklace, the postcarte tea towels, and marble coasters. I will post your giveaway on the sidebar! How are you doing Gail? Your new photos is beautiful - what a gorgeous happy smile! I'm a GFC folower (avalonne83). 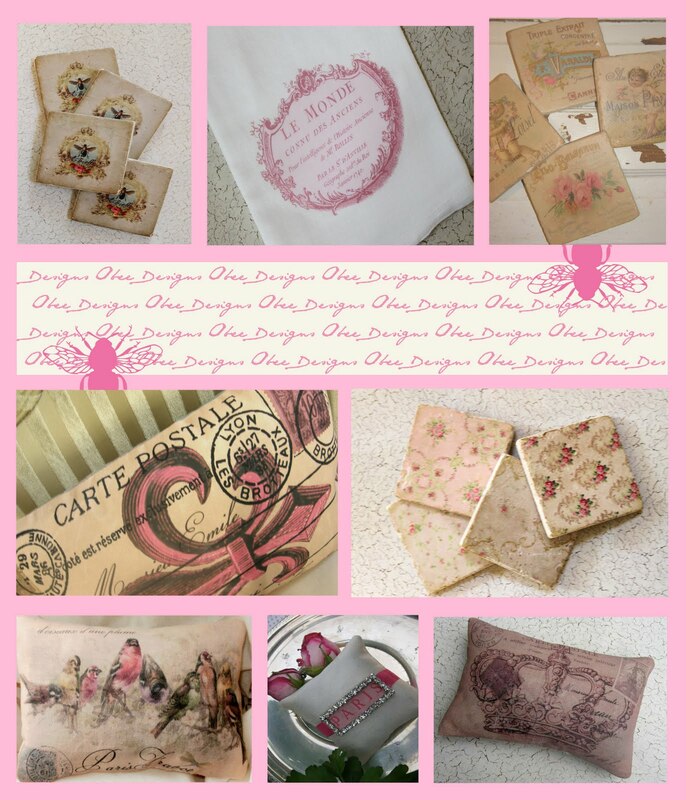 I like "2 SIDED ROSE COLORED VINTAGE FRENCH POSTCARD SACHET WITH CROWN , FLOWERS AND CRYSTAL EMBELLISHMENTS", "PINK VINTAGE FRENCH POSTCARD PILLOW WITH PINK FLEUR DE LIS" and "TAN VINTAGE FRENCH POSTCARD SACHET WITH FLOWERS AND BUTTERFLIES". Oh my gosh your shop is amazing! Love all the things in your shop, but love, love love, the U R in my heart necklace, the nead and dear t, and the near and dear necklace. and yoru Paris sachet is adorable too! Have a great fall, I miss you, I promise, I will get back to blogging soon! What a lovely give away-you are so sweet! I am having a give away too and would love it if if you entered! I had no idea you had so many gorgeous things in your shop! 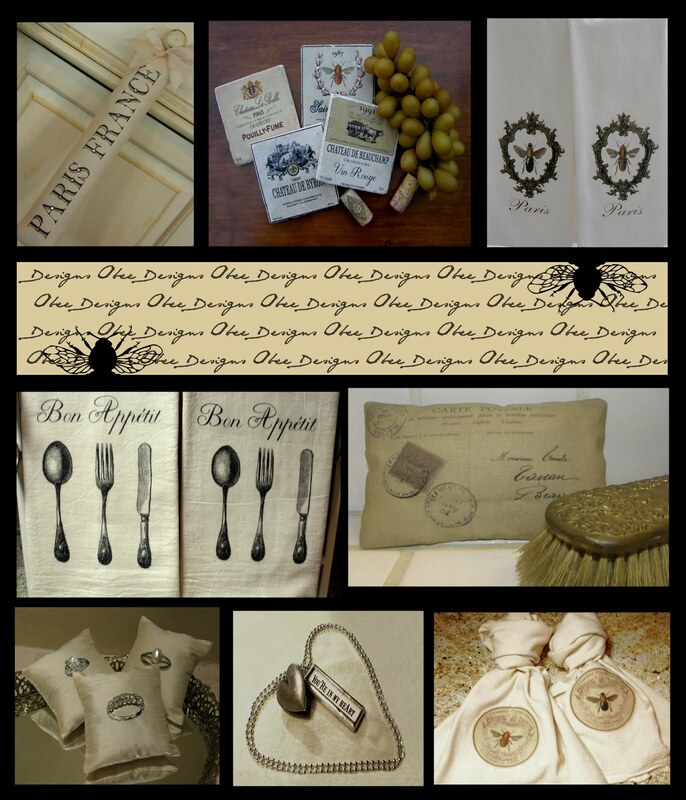 I adore the keep calm and carry on cushion and I also love the French tea towels and marble coasters...how could I choose just 3 things when there are so many divine items! Ooh La la! Oh my I just came across your wonderful blog and am so very glad I did!! Your Etsy shop is filled with delightful things! I became a beekeeper last year so the bees are just making my buzz with happiness!! Love all the Crown designs too! Became a follower of this wonderful blog! I love this fun giveaway. I must admit that I have never been to your etsy shop... my loss. I had been looking for bee things for a table design. You have wonderful treasures and lots of (of course) bee beauties! Those tea towels, in different designs would be my choice, along with that darling vintage bee. I am a faithful follower! I just love stopping by and soaking in all the inspiring posts on your bee-utiful blog. What a beautiful blog you have (and shop!) It'll be my pleasure to 1) follow you, 2) blog about this giveaway (tonight's post), 3) post this giveaway on my side bar, and 4)follow you on Facebook. My three fave items: a. Set of 4 marble stone tile country French coasters; b. set of 2 Parisian kitchen towels with vintage crests and bees and, c. set of 2 tea-dyed cotton waffle kitchen towels with colorized vintage French labels. I forgot to mention, I am also adding your blog to my blog roll. Hi, i just discovered your sweet blog and am a new follower! Can I pick them all? I love all of them! lol. Anyway, great job! I just want to tell that you are really good at this.